Every one of us is born with something special. Management lesson number one is "Master one trick or skill that would make you stand apart". As I write this article i.e. Management lessons that can transform you into a leader. These Management lessons are my learnings & interpretation from the book “who will cry when you die?” by Robin Sharma. By clicking the article link, you all have decided to live your life by choice rather than by chance. Every one of us is born with something special, may it be a particular skill or in-born talent or some kind of creative passion, may it be sports, music or literature. It is our responsibility to identify our core strengths by introspecting ourselves and make it our Unique Selling Proposition. Master one trick or skill that would make you stand apart. As there is a statement in a book “Art of war”; don’t fear a boxer/fighter who tried 100 kinds of punches 10,000 times but definitely fear a boxer who had practiced one particular kind of punch, 10,000 times. Don’t spend too much time thinking about an idea or concept but work towards converting that idea into a prototype and then finally pivot to an actual working product. Be always Action oriented. Write about your mistakes- you made and good things in a diary daily. Mention your learnings from each of these experiences (mistakes and successes). You will notice that over a period of time you would start making lesser mistakes and it would result in overall self-development. Your morning decides as to how your day would go. Start your day with positive thoughts, positive wisdom quotes and try to get into habit of waking up early. Early start of the day gives you a head start Vis a Vis your peers and fellow team members. Focus on resources that you have rather than constraints. Observe a child eating bread, they would eat the soft middle portion and would leave the hard side crusts. Working under constraints makes you to think harder and come up with creative solutions. Overcome fear of failure by taking action and avoid procrastinating on any idea. All the great inventors or geniuses were inspired to make the lives of other people more productive and enriched. Try to do things that you always wanted to do and don’t even think of failures. Yes failures are the steps in the process of achieving success. Remember, Failures are nothing but success delayed. You are bound to achieve success with your persistence and hard work and resilience. To be successful, you need 3 core ingredients hard work, Persistence, and Resilience. Take one step a day towards your goal daily. If you want to lose weight, you join Gym, you would not lose weight by exercising 5 hours daily but you will see significant weight loss, if you exercise 30 mins daily consistently for over 6 months without any breaks or loss of momentum. Most of the successful people create a mastermind alliance with a group of like-minded people who are tied by similar values, similar philosophies. The alliance is all about mutual benefits so you must be able to give as much as you expect to receive. Discuss the challenges that you are facing and ask for the group’s input. It is what I call collaborative learning approach. I hope my article would help aspiring entrepreneurs, corporate managers to think and invest in self-learning to realize their goals & aspirations. I can be reached on riteshmohan@yahoo.com, in case any of my retail fraternity member needs my help with any of their retail issues or problems. I would be more than glad to help my fraternity members with my wisdom. Reference book: “who would cry, when you die” by Robin Sharma. 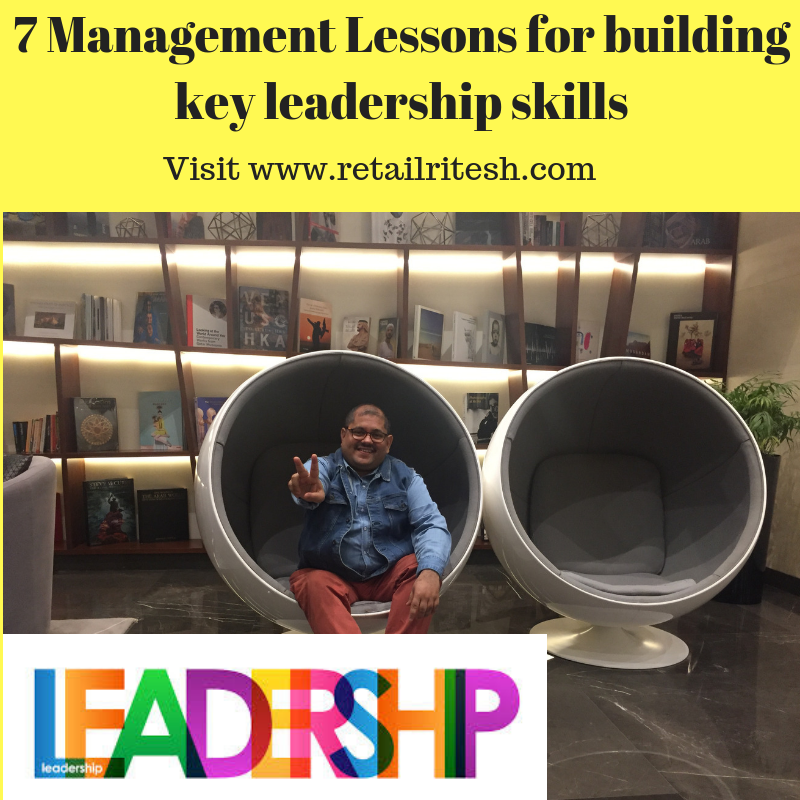 Ritesh Mohan is a passionate retail professional with over 20 years in the Retail sector, handling some of the biggest brands in beauty, fashion and fragrances retail & FMCG sector. Ritesh has been instrumental in the growth of some of the regional brands as well in Middle East region. He specializes in Retail management, Product development and Brand management, Retail Operations, Sales Management and Franchising & Business Management. He strongly believes in empowering business owners with his wisdom & experience of around two decades in the industry. Even people knows the mantras, very reluctant to adopt, because I’m done attitude or I’m much more than that. This article really giving an insight to refresh or rejuvenating approach to skills. thanks, Joe for your kind words. yes, self-realization is required. Life is a continuous learning journey. Of the 7 lessons, I think Number 1 “Find your purpose or Why” is the most encouraging. There is a method for the other 6, but not for this one. Agree? Yes leonardo, “find your purpose” is the most important one. You need to know or evaluate why you are doing things instead of how you are doing this. This is the core of leadership. thanks for your valuable comment, I am glad that you liked the article. stay connected.